THE NATURAL HAVEN: Does conditioner or oil really need to penetrate hair? Does conditioner or oil really need to penetrate hair? Oops I forgot to post this yesterday but here it is now! The question about whether oil or conditioner NEEDS to penetrate hair arises time and time again in the comments section and therefore I thought it deserved its own post. 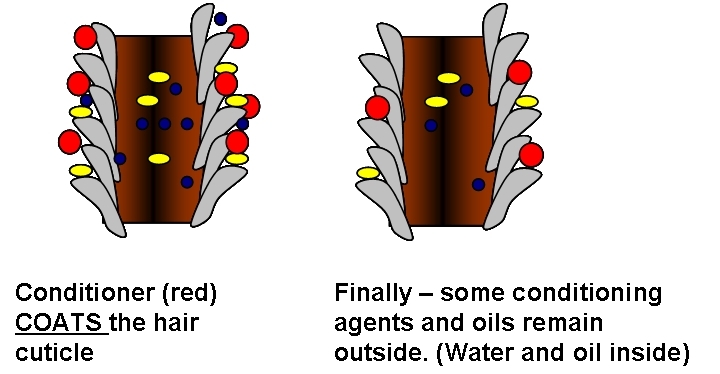 No, the effectiveness of a hair conditioner or an oil is not based on whether it penetrates hair or not. Different ingredients have different purposes, some work most effectively outside hair while others perform their best function inside hair. We also have to bear in mind that hair is individual, someone with bleached hair may require different ingredients than someone without it. Someone who regularly straightens their hair will require different ingredients too compared to someone who is heat free. Someone whose hair is drier and more prone to breakage, again will have different requirements to someone who really never experiences breakage. Surfactants e.g behentrimonium chloride, behentrimonium methosulfate, stearalkonium chloride, cetrimonium chloride, dicetyldimonium chloride Used in a hair conditioner - rinse out or deep conditioner These ingredients act on the surface of the cuticle to help smooth it down (remember that the negative charge in shampoo can raise the cuticle). They also soften the cuticle layer and when co-washing, these are the same ingredients needed to clean the surface of hair. Hair softeners e.g the surfactants listed above, cetyl alcohol, stearyl alcohol, cetearyl alcohol, some polyquaterniums Used in hair conditioner - rinse out, deep conditioner or a leave in These ingredients again deposit on the surface of hair and soften the outside of hair..
Water During a wash or for moisture Water does not always have to penetrate hair. When cleaning hair, some water is necessary to wash extra product off. It can also help with creating slip for detangling when on the outer surface of hair. For proper moisture, some water needs to remain outside of the hair shaft to create a humidity barrier. Mineral oil In a leave in Mineral oil is known not to penetrate hair. It is useful as a barrier from humidity after hair has been appropriately moisturised with water, humectants and/or a leave in conditioner. Hydrolysed protein In a hair conditoner Protein can act to patch breaks, flaws and chips in the cuticle. For this purpose, the protein should stay on the outside of the surface. As as leave-in Both of these products when applied to the outside of hair help to create a humidity barrier and keep hair moisturised. Water During a wash, in a hair conditioner or when moisturising (dampening hair) When water penetrates hair it softens it. This can help when detangling hair, provided detangling is done with care. Trapping the water inside the hair is also the key to having moisturised hair. Hydrolysed protein In a hair conditioner - rinse out, deep or leave in Protein of the right size can penetrate hair and help to strengthen it. Ceramides In a hair shampoo or conditioner - rinse out, deep conditioner or a leave in Ceramides can penetrate hair in a shallow way, normally underneath the cuticle and just a little bit into the cortex. They act to replace the cuticle cement (a fatty acid complex that holds the multiple cuticle layers). 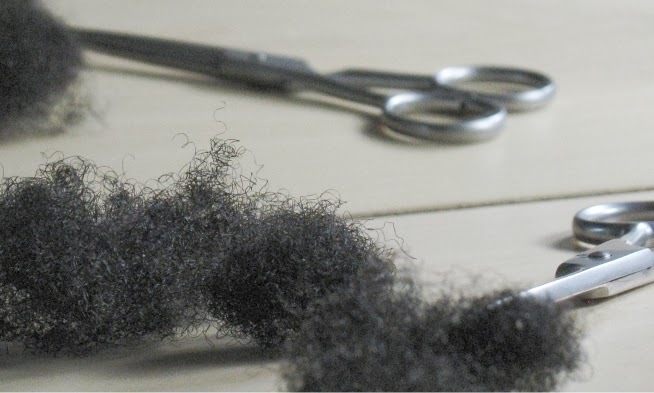 In general hair that is relaxed or bleached benefits the most from ceramides as normal washing of hair in general does not greatly deplete the cuticle cement but some naturals do still like ceramides. Perfect timing!! This is the first time I'm hearing of using ceramides for hair. Do you have any info about specific products with ceramides? I'm the meantime, I see what I can dig up on my own. Hi JC, are ceramides useful for those with highly porous strands, even when natural? I used the L'Oreal restore 5 conditioner in the red and white bottle today, it has ceramides and I think (best to check yourself though) that it is 'cg' for anyone doing cg/cowashing. Your blog is always so useful! Very interesting article, I really like how you address the things that I haven't seen confronted and demystified elsewhere. I'd also love to know more about products where we can find helpful ceramides, and if they are present in oils (like rice bran) and can be used that way. After reading your articles on dandruff, I found myself wondering what I should use as a deep conditioning prepoo; after learning that coconut oil, Shea butter...pretty much all of the great oils that soften my hair are ruled out for usage, I thought about Neem oil as an alternative DC prepoo. 1.Would it be safe to use pure Neem oil as an overnight DC prepoo,or would that be dangerous? It seems like it has powerful anti-fungal properties, so strong that people mix it in carrier oils that feed Malassezia. 2. Are there any oils, aside Neem oil, that people prone to dandruff can use as DC prepoo's? Thank for all of your help. I've benefited so much from your expertise. As I am writing this comment I am trying the honey treatment you mentioned. I hope the honey works for you. For dandruff, I generally would recommend avoiding placing oils or any other products on your scalp for prolonged times. Things like doing an overnight DC can really irritate sensitive skin. If you perhaps focussed on just the ends, it may be ok but it is pretty hard to completely avoid the scalp especially if you intend to lie down at night. Thanks for the article! I mostly use argan oil from pro naturals to treat my hair and it penetrates really deeply. Hi Jc! This is not exactly related...but I believe I've read on here that DCing overnight with conditioner (or "prepooing" overnight) can lead to overmoisturizing the hair. Do you think the hair will react similarly if one uses conditioner as a leave-in? The more I think about it the more I'm led to believe that conditioner would be okay (as any leave-in will be waterbased) but I still wonder. I use a lot of conditioner/leave-in. Using a conditioner as a leave in will not have the same effect as keeping it on your hair overnight with a plastic cover to keep the conditioner wet. As a leave in the water content of the conditioner will naturally go down over the day. Great article! I've been looking over your blog and not only do you research things but you stay accurate. Thank you! Mineral oil does not prevent water entry into the hair, it does slow it down a little. I think everyone has to make their own choices about ingredients and the only way someone will know if it works or not, is to try it. Can I use a strengthening ceramide mask instead of clay for the max hydration of natural hair?